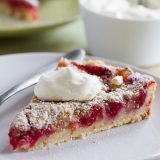 The perfect fall dessert, this Pear and Raspberry Tart takes advantage of ripe, sweet pears and tart raspberries for a beautiful tart that is worthy of company. In a large bowl, combine the flour and sugar. Cut the butter in with a pastry cutter or a fork until it resembles coarse crumbs. Stir in the macadamia nuts. Press the mixture into the bottom and up the sides of an 11-inch fluted tart pan with a removable bottom. In another bowl, combine the pears, sugar, cornstarch, cinnamon and lemon zest and lightly stir to combine. Gently fold in the raspberries. Pour the mixture into the prepared crust and spread evenly. Bake in the preheated oven for 25 minutes. Meanwhile, combine the flour, sugar, lemon zest and macadamia nuts. Sprinkle over the top of the filling. Bake for an additional 15-20 minutes, or until the topping is browned and the filling is bubbly. Remove from the oven and allow to cool.